The Denver Nuggets 2017-18 season has come to a close after a gut-wrenching and heart-breaking overtime loss to the Minnesota Timberwolves, but there is no time for grief or sadness. There is still quite a lot of work to be done. Denver’s upcoming offseason may define the Tim Connelly and Michael Malone era of Nuggets’ basketball. The 2018-19 season will be the first year that Denver will be operating as bonafide playoff contenders with hefty expectations surrounding them. After winning 40 games in 2016-17, the Nuggets made a six-win jump and finished the season 46-36 in 2017-18 even with Denver’s $30 million man Paul Millsap missing 44 games among a plethora of other injuries throughout the roster. Simply, almost everything that could have gone wrong for the Nuggets did go wrong, and they still found a way to win 46 wins. There will be many who predict the Nuggets will win upwards of 50 games or more in 2018-19, but before the Nuggets can get there, they have to continue doing what they can to improve the roster this offseason. 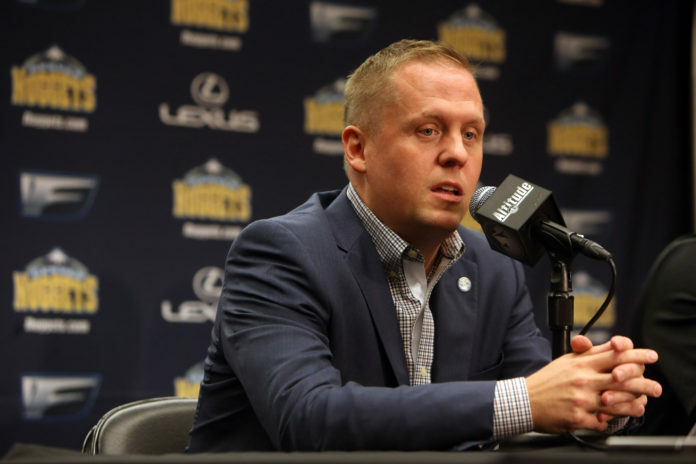 Nuggets’ President of Basketball Operations Tim Connelly has made a name for himself in the draft and he will be armed with three draft picks in the upcoming draft: one first round pick and two second-round picks. In addition to the picks that the Nuggets’ have, they will also be sending out their own second round pick as well. The Nuggets own their own every one of their future first-round picks and none other. After falling a game short of the playoffs, Denver is currently slotted with the 14th best lottery odds, which sounds a lot more promising than it actually is. The 14th best lottery odds equates out to just a 1.8 percent chance of a top-three pick and a minuscule and fanciful 0.5 percent chance at the top pick. Hoping for the basketball gods to grace the Nuggets with the correct lottery balls will be a losing proposition for Denver. That means that the Nuggets will likely own the 14th pick in the 2018 NBA Draft this year. Regardless, Denver owning all of their future first-round picks is the most important thing. They will have ammunition every offseason as long as they hold onto their first-round picks. There are five different second round picks that are either coming or going to or from the Nuggets with three of the selections taking place this year and the final two picks set to take place in the 2019 NBA draft. There are two second-round picks incoming in 2018 with the third second-round pick paying dividends in 2019. The Nuggets will receive a 2018 second-round pick from the Golden State Warriors. This draft pick originally comes from the three-way trade that sent Andre Iguodala to the Warriors in 2013 and brought Randy Foye to Denver. There are no protections on this second-round pick and it will be the second to last selection of the 2018 NBA Draft — the 58th pick. 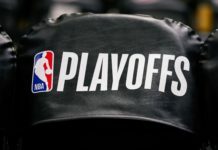 The Nuggets will receive a 2018 second-round pick from the Los Angeles Clippers from the three-team trade that brought Devin Harris to Denver and sent Emmanuel Mudiay to the New York Knicks while also sending Doug McDermott to the Dallas Mavericks, who received the better of the Clippers and Knicks second-round picks. Because the Clippers finished with a better record than the Knicks, the Nuggets will get the Clippers second-round pick. There are no protections on this second-round pick and will be the 43rd selection in the 2018 NBA Draft. The Nuggets will receive a 2019 second round pick from the Washington Wizards from the three-team deal that sent Danilo Gallinari from Denver to the Los Angeles Clippers back in July of 2017. The Atlanta Hawks sent the Nuggets Washington’s second-round pick as part of the deal. There is no protection on this second-round pick. There are two second-round picks outgoing from the Nuggets to another team; one in 2018 and one in 2019. The Nuggets will send their own 2018 second round pick to the Los Angeles Lakers from the 2013 sign and trade that brought Andre Iguodala to the Nuggets. There are no protections on that second-round pick. The Nuggets will send their own 2019 second-round pick to the Milwaukee Bucks from the trade that brought Roy Hibbert to the Nuggets in the 2016-17 season. That second-round pick is protected 31-55, which is every single pick in the second round of the draft not in the last five selections. The pick will only convey if it is one of the final five picks of the 2019 NBA draft. If the pick falls between picks 31-55, Denver’s obligation to send a second-round pick to the Bucks dissipates and the Nuggets return to owning their own second-round pick. The Nuggets, as well as players on the roster, will have quite a few decisions to make this offseason that could have massive repercussions for the future of Nuggets’ basketball. Denver has two players on its roster who have player options as well as an ominous team option for Nikola Jokic. In addition to the different options available, the Nuggets also have three players on the roster that will be unrestricted free agents once the new NBA year begins on July 1st. There are two player options that are going to have major cap implications. The first player is Darrell Arthur, who has a $7.46 million player option for the last year of his three-year contract worth $23 million. Considering That Arthur played in just 19 games and just 141 minutes, it is a virtual lock that Arthur will opt-in to the final year of his three-year deal. While Denver would love to open up nearly $8 million in money, without trading Arthur or Arthur randomly retiring, there is almost no way that Arthur isn’t on the roster next year and getting paid $7.46 million. The second player option on the Nuggets’ roster is Wilson Chandler, and his option has led to lots of speculation by media and the Nuggets’ front office alike. Chandler will be 31-years-old by the time he either opts into his final year with the Nuggets or dives into free agency. It is hard to see a 31-year-old Chandler manage to get more money per year than his $12.8 million he could get next year should he opt-in. With that being said, it seems obvious that he would opt-in on the final year of his four-year, $46.5 million deal. Things may not be that simple. Chandler has been vocally frustrated with the Nuggets before so the prospect of getting one final contract with more years and a smaller yearly salary could sound appealing to Chandler, who has battled injuries for the majority of his career. While the Nuggets organization would be happy if Chandler opted-out of his contract, it is essentially a toss-up on if Chandler plans to opt-in or not. The Nuggets have three unrestricted free agents to deal with this offseason. While two of the unrestricted free agents are pretty straight forward situations, it is the third that throws a wrench into the equation. Let’s start with the first two unrestricted free agents. D. Harris, who was acquired at the trade deadline, will have his contract expire on July 1st, effectively making him an unrestricted free agent. While the Nuggets will have a hole to fill at back-up point guard this summer, there is a very real situation where Harris chooses to play in a different uniform next season even after playing well in the final seven games for the Nuggets. Richard Jefferson will also see his contract expire on July 1st, just nine days after his 38th birthday. 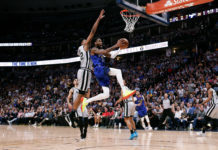 There could be interest between Jefferson and the Nuggets to bring him back if there is a roster spot open, but bringing back Jefferson is not a high-priority item for a Nuggets’ team looking to improve their roster in their pursuit for their first playoff berth in five years. The third and final unrestricted free agent is Nuggets’ hyper-versatile wing, Will Barton. Barton does enjoy playing in Denver for the Nuggets and enjoys his teammates as well. Gary Harris and Barton have become especially close and Barton has been a huge influence in the development of Murray. Barton did turn down the four-year extension offered to him that was worth $42 million, so the odds are that Barton wants more than the $10.5 million a year that the Nuggets were able to offer with that extension. With Barton headed for unrestricted free agency, he could choose to come back to the Nuggets if he so chooses and if the money is right, but odds are that another team offered Barton more than the Nuggets can afford. 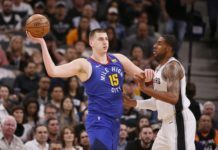 The last decision the Nuggets will have to make will involve their best player and the embodiment of a bright future for Denver Nuggets’ basketball; Nikola Jokic. Because Jokic was a second-round pick, there is a strange wrinkle to his contract. The Nuggets have a team option that they could exercise next season worth just $1.6 million. That sounds great on the surface, but there is a very dangerous catch if the Nuggets decide to pick up that team option. If the Nuggets decide to pick up Jokic’s team option for the 2018-19 season, Jokic will then become an unrestricted free agent in the 2019 offseason, but if the Nuggets decline Jokic’s team option, he becomes a restricted free agent in the upcoming 2018 offseason. The Nuggets future is predicated on Jokic being in the Mile High City, so the odds are that Denver declines Jokic’s $1.6 million team option and signs him to a full max contract this offseason as to make sure he is in a Nuggets’ uniform for years to come. 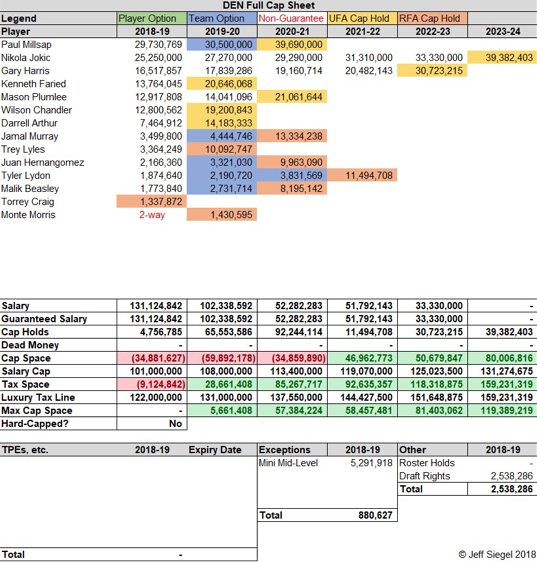 Yes, the Nuggets would be $9.1 million into the luxury tax without Barton, Jefferson, or D. Harris. 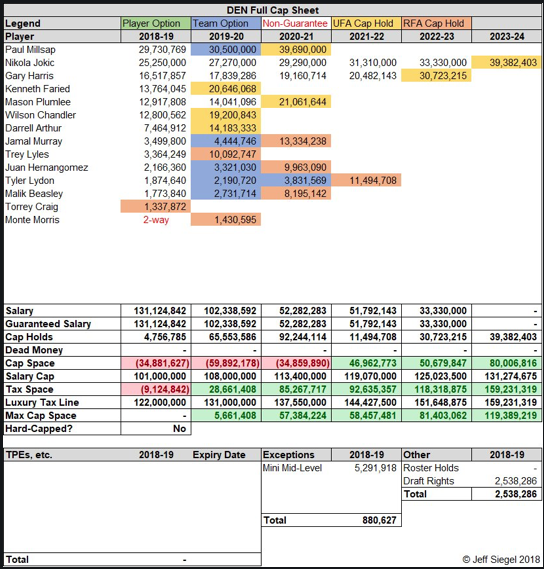 Luckily, the Nuggets have full bird rights with both Barton and Jokic so Denver can go as far into the tax as they want to resign them, but it seems highly unlikely that Nuggets’ governor Josh Kroenke will sign off on a luxury tax bill to keep Barton in the fold. The Nuggets will have one hefty price tag on their roster after they max-out Jokic and will still have glaring needs at point guard and small forward. The Nuggets’ front office has a lot of work to do to clear money or else it will be a very slow and quiet offseason for Denver.